The Paracel Islands, also known as Hoàng Sa in Vietnamese (Xisha in Chinese), is a group of islands, reefs, banks and other maritime features in the South China Sea. It belongs to Vietnam and nowaday has been invaded by the People's Republic of China, and also the-wanted target by Taiwan. The archipelago includes about 130 small coral islands and reefs, most grouped into the northeast Amphitrite Group or the western Crescent Group. They are distributed over a maritime area of around 15,000 square kilometres (5,800 sq mi), with a land area of approximately 7.75 square kilometres (2.99 sq mi). The archipelago is approximately equidistant from the coastlines of China (PRC) and Vietnam; and approximately about one-third of the way from central Vietnam to the northern Philippines. Turtles and seabirds are native to the islands, which have a hot and humid climate, abundant rainfall and frequent typhoons. The archipelago is surrounded by productive fishing grounds and a seabed with potential, but as yet unexplored, oil and gas reserves. The Amphitrite group was named after the French frigate Amphitrite of the Jesuitmissionary. Lying in the northeast of the Paracel Islands at 16°53′N 112°17′E, the group consists of low narrow islands with sand cays, enclosed shallow lagoons connected by reefs of rock, and is about 37 km (23 mi) northwest of Lincoln Island. The group approximately forms an ellipse with a north-south axis of 22 km (14 mi). The northern section of the group comprises West Sand, Tree Island and the Qilian Yu sub-group (The "Seven Sisters": North Island, Middle Island, South Island, North Sand, Middle Sand, South Sand and two small "sands".) The centre of the group consists of Woody Island and Rocky Island, approximately 5 km (3 mi) south of the southern tip of the eastern extremity of the northern section. The southwest corner of the group is occupied by the Iltis Bank. The largest island of the Paracels, Woody Island (which has an area of 213 ha (530 acres)), has over 1,000 residents including fishermen and their families, military personnel and civilian administrators. Lying about 70 km (43 mi) southwest of the Amphitrite group, at 16.5°N 111.7°E, the Crescent group consists of islands and reefs that form a crescent-like structure from west to east, enclosing a deep central lagoon. The group measures 31 by 15 km (19 by 9 mi) east-west and north-south. All of the islands in the group support vegetation except on their small cays. The islands are named after former senior figures in the British East India Company. Three were members of the EIC's 'Select Committee' in Canton: James Drummond, Thomas Pattle and John William Roberts. Jonathan Duncan was Governor in Council of Bombay and William Taylor Money was Superintendent of the Bombay Marine. The Chinese name for Money Island is simply the translation of the word 'money - Jin Yin Dao. Money Island' lies at the southwest extremity of the group, and has some small cays in the southern side. Antelope Reef, submerged at high tide and containing a central lagoon, lies 2.4 km (1.5 mi) east of Money Island. Northeast of this are Robert Island (also named Round Island) and Pattle Island, separated from each other by a 3.5 km (2.2 mi) wide deep channel. A weather station was built on Pattle Island (by the French) in 1932, and a lighthouse and radio station in 1937. Northeast of this is Quanfu Dao ("All Wealth Island"). Observation Bank, also named Silver Islet, and the Lesser Silver Islet, are the northernmost of the group and contain a small cay. Just south of them are Yagong Dao (He Duck) and Xianshe Yu (Salty Hut). At the eastern side of the group lies a 12 km (7 mi) long boomerang shaped reef with Stone Islet at its north end and Drummond Island at its south end. The Duncan Islands (16°27′N 111°43′E), consisting of Duncan Island and Palm Island, lie approximately 3 km (2 mi) west of Drummond Island and about 8 km (5 mi) east of Antelope Reef. Kuangzai Shazhou (Little Basket) lies about halfway between Palm Island and Antelope Reef. Taking 16°40′N 112°20′E as the centre of the Paracel Islands, then the Amphitrite Group is ENE, and the Crescent Group is West. Bombay Reef: This elongated reef is situated at the southeastern corner of the Paracel Islands ( 16°N 112.5°E) and lies approximately 90 km (56 mi) southeast of the Crescent Group. With most parts submerged, the reef measures approximately 18 by 5 km (11 by 3 mi) (E-W by N-S). Bombay Reef encloses a deep lagoon with rocks on its edge. Bremen Bank: Located 24 km (15 mi) north of Bombay Reef ( 16.3°N 112.5°E), is the southwestern-most feature of this subgroup. This submerged shallow bank measures approximately 23 km (14 mi) in length from northeast to southwest. The shallowest area reaches a depth of about 12 metres (39 ft) and is located in the southwestern part of the bank. Lincoln Island: Surrounded by a coral reef, located 37 km (23 mi) southeast from the Amphitrite Group at 16.7°N 112.7°E, the island is covered with brushes and fairly high trees, including coconut palm trees. The depth increases sharply on the northern and eastern sides of the island but the southern and south western regions are shallow. An observation post on the western side was found by officers of the German government surveys in 1883. In 1948, Great Britain requested France for permission to use the feature for military exercises. North Reef: Situated approximately 56 km (35 mi) north from the Crescent group and about 70 km (43 mi) west-northwest from the Amphitrite group at 17.1°N 111.5°E,the reef is the most northwesterly feature of the Paracel Islands. Most parts of the reef are submerged. There are rugged rocks are around the edge that are barely above water. There is a passage into the lagoon on the southwestern side of the reef. Discovery Reef: Measuring approximately 27 km (17 mi) in length from east to west, and 7 km (4 mi) from north to south, the reef is located about 18 km (11 mi) south of the Crescent Group at 16.25°N 111.7°E. Completely submerged, the elongated ring structure is the largest single reef in the Paracel Islands. The reef has two large, deep openings into the lagoon on its southern side. Passu Keah: This small reef encloses a shallow lagoon and is located about 12 km (7 mi) south of the eastern side of Discovery Reef at 16.1°N 111.8°E, approximately 37 miles (60 km) east-northeast from Triton Island. The sand cay measures 9 km (6 mi) in length. 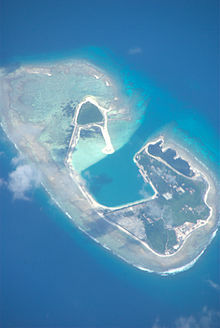 Triton Island: The sand cay supports vegetation and stands on a steep-sided coral reef measuring 1.5 km (1 mi) in length. This southwesternmost island of the Paracels is situated about 56 km (35 mi) from Discovery Reef at 15.8°N 111.2°E. Vuladdore Reef: Located slightly south of the centre of the group at 16.3°N 112°E, this mostly submerged reef is orientated east-west and measures approximately 12 km (7 mi) by 3 km (2 mi). Some small spiral rocks are to be seen on the reef. Herald Reef at 15.8°N 112.3°E. Rocky Island Shidao (石岛) Đảo Đá 16°46′N 112°21′E 8 14 Connected to (NE of) Woody Is. Antelope Reef Lingyang Jiao (羚羊礁) Đá Hải Sâm 16°27′N 111°35′E 0 W Crescent Group, S of Robert Is. 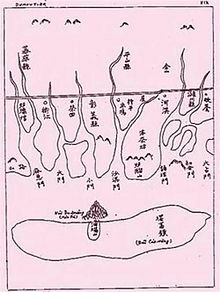 "Water can be found on the island"
Paracel Islands as shown in Zheng He Voyage Map (suggested by some to be the islands to the left at the bottom). 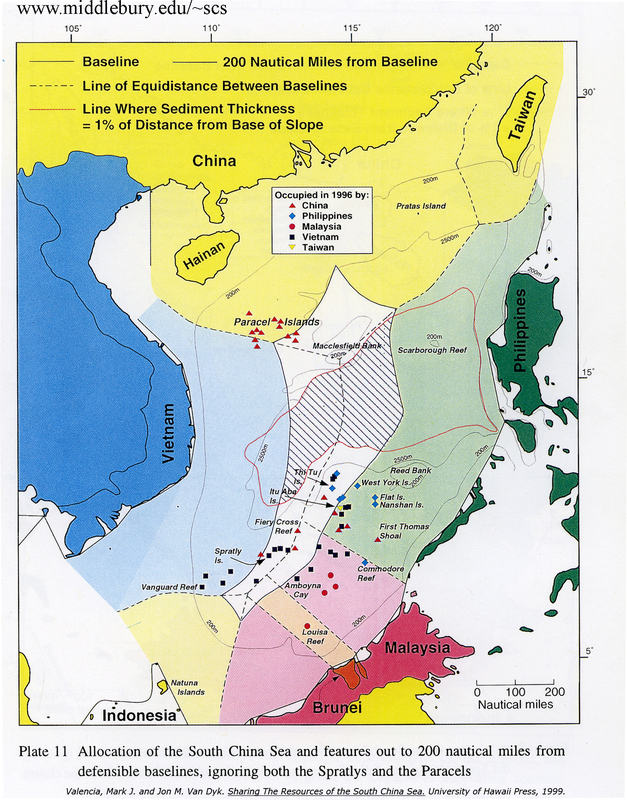 The Chinese name Xisha (西沙), literally "western sands" or "shoals", is a name adopted in the 20th century to distinguish it from the "eastern sands" (the Dongsha or Pratas), the "southern sands" (the Nansha or Spratlys), and the "central sands" (the Zhongsha orMacclesfield Bank). Prior to that, there had been no consistent designation of these islands in early Chinese sources, with names such asChangsha, Shitang, Shichuang and others being used for Paracel and Spratly apparently interchangeably. In the Song Dynasty workZhu fan zhi by Zhao Rugua, the names Qianli Changsha (千里長沙, lit. "Thousand-mile Long Sands") and Wanli Shichuang (萬里石床lit. "Ten-thousand-mile Rock Bed") were given, interpreted by some to refer to Paracel and Spratly respectively, but opinions differed.The Yuan dynasty work Daoyi Zhilüe by Wang Dayuan considers that Shitang (石塘) to be the same as Wanli Shitang (萬里石塘, lit. "Ten-thousand-mile Rock Embankment"), which starts from Chaozhou and extends to Borneo, west to Côn Sơn Island off Vietnam and down as far as Java. The History of Yuan uses the terms Qizhouyang (七洲洋, "The Ocean of Seven Islands") and Wanli Shitang, which are taken to mean Paracel and Spratly respectively. In the Mao Kun map from the Zheng He's voyage of the early 15th century, groups of islands were named as Shitang (石塘), Wansheng Shitangyu (萬生石塘嶼), and Shixing Shitang (石星石塘), with Shitang (sometimes including Wansheng Shitangyu) being taken by some to mean Paracel. Another Ming text, Haiyu (On the Sea), uses Wanli Shitangto refer to Paracel and Wanli Changsha for Spratly. During the Qing dynasty, a set of maps refer to Paracel as Qizhouyang (Shitang became Spratly, and Changsha became Zhongsha), while a book Hai Lu (Illustrations of the Sea) refers to Paracel as Changsha and Spratly as Shitang. A sea chart prepared in the Daoguang era, Yiban Lu (Particular Illustrations) by Zheng Guangzu, uses Xisha to refer to Paracel. Xisha was also used in 20th century maps published by the Republic of China, for example in 1935, and the 1947 11-dash line map which claimed Paracel and Spratly as its territories. The Vietnamese call the islands Hoang Sa, (黃沙 or Yellow Sands), and this name is found in historic Vietnamese documents dating back to the 15th century. In the modern language system it is written as Hoàng Sa or Cát Vàng. They all have the same meaning — the Yellow Sands or the Yellow Sandbank. Before the early 19th century, the present-day Spratly Islands were treated as features of Hoàng Sa. It was not until the reign of Emperor Minh Mạng (1820–1841) that the Spratlys were distinctly delineated and officially named Vạn Lý Trường Sa (萬里長沙), the Ten-thousand-league Long Sandbank. Chinese researcher Li Jinming, however, claims that the original "Hoang Sa" in historic Vietnamese documents is along the coast of the Vietnamese shore, and not the modern Paracel or Spratly Islands. The name 'Paracel' is found in the first Portuguese maps of the region. The Portuguese, whose vessels frequented the South China Sea as early as at the beginning of the 16th century, were the first to refer to these islands as 'Ilhas do Pracel' in the 16th century. Regarding the likely origin of the term Paracel, the word is a variant of the more common form pracel or parcel, from the Spanish:placer, which was used by the Portuguese and Spanish navigators to designate shallow sandy seas or submerged banks, such asPlacer de los Roques. Pracel is a moderately elevated chain of islets, sandbanks, and reefs. These features are continuously distributed and stretched over a noticeable distance of tens or hundreds of kilometers in length. Pracel may not be a suitable place for human residents, but its irregular depth creates an ideal environment inhabited by fish. Pracel often forms a natural bulwark as an outer line of defense for a coast or a land. The Portuguese were later followed by the Dutch, the English, the Spanish, and the French in the waters of the island group. On the "Map of the coast of Tonquin and Cochinchina", made in 1747 by Pierre d'Hondt, the dangerous band of rugged rocks was labeled "Le Paracel", a French phonetic notation. Because of their location on an important seaborne route the Paracel Islands drew much attention from navigators and hydrographersin the Age of Exploration. Disputes in the area since the Second World War have again drawn attention to the islands. On the "Map of Europe, Africa and Asia" published in 1598 by Cornelis Claesz, an unnamed band of rocks and sandbanks are shown near the present-day location of the Paracel and Spratly Islands. About two decades later, the names Pracel and Costa de Pracel (Coast of Pracel) appeared on the Chart of Asia and eight city maps published in 1617 byWillem Jansz Blaeu, a Dutch map maker. The coast belonged to the Kingdom of Cauchi China. The islands were first scientifically surveyed by Daniel Ross of the English East India Company in 1808. The names of Duncan, Drummond, Money, Pattle and Roberts islands were all chosen in honour of senior figures in the East India Company. The PRC is investing "millions" in infrastructure and development to support its territorial claims over the Archipelago, and as a result there has been, and continues to be, a lot of construction activity. In recent years Woody Island has acquired an upgraded airport, an upgraded sea port, and a city hall. A primary school for children of construction workers and troops stationed there is planned. There is limited supply of fresh water on the islands. In 2012, it was reported that China (PRC) planned to build a solar-energy-powered desalination plant on the islands. Both wind and solar powered facilities exist to supply electricity on the islands. There is a post office, hospital, bank and hostel on Woody Island. The Chinese postal zip code of the island is 572000, and the telephone area code is +86 (898). There is an airport on Woody Island with a 2,400 metres (7,900 ft) long runway, which can handle take-offs and landings of Boeing-737s or planes of similar size. Flight services operate on the Haikou – Xisha route. There are three main roads on Woody Island as well as an 800 metres (2,600 ft) long cement causeway that connects Woody Island and Rocky Island. Extensive port facilities have been constructed on Duncan Island. Paracel Islands' geographical and ecological traits are often likened as "China’s Maldives", however, controversial conflicts between environment conservation and human activities including military operations, developments, and tourism on Paracel Islands have become public concerns in recent years. Local ecosystem include endangered ocean and bird species such as critically endangered green sea turtles and hawksbill sea turtles, however, direct damaging on ecosystem by military group and tourists have been documented .Governmental actions to cease illegal tourism are ongoing. The islands have been open for tourists since 1997.Chinese tourists can take a 20-hour ferry to the Islands, paying up to US$2,000 for a 5-day cruise, and are placed on a long waitlist before being accepted. The BBC article states that "Chinese tourism has strong political implications, as the Chinese tourists are being used as 'foot soldiers of China' by Beijing to further China's territorial claims there". The video also states "Vietnam is considered unlikely to send military vessels to stop them". There are two museums on Woody Island; a Naval Museum and a Maritime Museum. In April 2012, the Vice-Mayor and officials from the Haikou Municipal Government made several announcements about developing new docking facilities and hotels within the Crescent Group - on Duncan and Drummond Islands specifically. Promotion of the naturally unspoilt reef system was cited as the driver for new tourism potential with other such reefs, such as the Great Barrier Reef in Australia, now placed under threat of extinction due to human activities. However, according to The China Post, this was denied by a PRC Government official in April 2012, due to sensitivities surrounding the islands. China first asserted sovereignty in the modern sense to the South China Sea’s islands when it formally objected to France’s efforts to incorporate them into French Indochina during the 1884–1885 Sino-French war. After the war, France recognized the Paracel's and Spratly's islands as Chinese territories, in exchange for Chinese recognition of Vietnam as a French territory. Chinese maps since then have consistently shown China’s claims, first as a solid and then as a dotted line. Between 1881 and 1883 the German navy surveyed the islands continuously for three months each year without seeking the permission of either France or China. No protest was issued by either government and the German government published the results of the survey in 1885. In 1932, France nonetheless formally claimed both the Paracel and Spratly Islands. China and Japan both protested. In 1933, France seized the Paracels and Spratlys, announced their annexation, formally included them in French Indochina, and built a couple of weather stations on them, but did not disturb the numerous Chinese fishermen it found there. In 1938 Japan took the islands from France, garrisoned them, and built a submarine base at Itu Aba (now Taiping / 太平) Island. In 1941, the Japanese Empire made the Paracel and Spratly islands part of Taiwan, then under its rule. After the communists gained control of China in 1949, they occupied Woody Island, the main island of the Amphitrite group and the only island that was occupied at the time. Pattle Island in the Crescent group, on the other hand, was later taken by French Indochina and then controlled by South Vietnam following independence in 1956. Tensions over the islands have continued to rise unceasingly since then. Most of the Paracel Islands are within China's 200 nautical-mile EEZ as defined by UNCLOS. In 1974, the political and diplomatic dispute over the islands became an armed conflict between China and South Vietnam. On January 16, South Vietnamese naval officers and an American observer reported to Saigon some suspected military activities of the Chinese navyon the Drummond and Duncan islands. After receiving the report, the government of South Vietnam decided to counter the Chinese forces, to defend the South Vietnamese-controlled section (the western half of the Paracels) from Chinese occupation, and sent a unit of frigates to the area. On January 19, there were sea and land battles between the Chinese and Vietnamese forces with casualties on both sides. At the end, the Chinese fleet defeated the naval force of South Vietnam. With the ongoing civil war with the Viet Congembroiling South Vietnam's attention and the absence of the USA's support, no military attempt was made to re-engage the PRC over the islands. After the military engagement and the subsequent victory, the PRC gained the entire archipelago and has taken control of Paracel Islands ever since. It was a significant turning point for the PRC but the sovereignty dispute on the islands remains unresolved withVietnam. The Route through Quảng Nammap depicting Bãi Cát Vàng – the Golden Sandbank – off the coast ofQuảng Nam, 1634. 1460–1497, under the reign of Emperor Lê Thánh Tông, the Vietnamese began conducting commercial activities on and around Hoàng Sa, including harvesting abundant sea-products and conducting salvage operations on shipwrecks. In 1634, under the Lê dynasty (1527–1786), the ship Grootebroek of the Dutch East India Company sank in the vicinity of the Paracel archipelago. Using a small boat, captain Huijch Jansen and 12 sailors managed to reach Annam, territory of Lord Nguyễn Phước Nguyên (1613–1635), to seek rescue for other castaways remained on the islands. 1680–1705, Lord Trịnh Căn instructed Đỗ Bá Công Đạo to publish Thiên Nam tứ chí lộ đồ (天南四至路圖), an encyclopedia consists of 4 series of maps that detail routes from Thăng Long, capital of Đại Việt, to other countries in the Southeast Asia. Part of this work was based on the Hồng Đức Atlas (Hồng Đức Bản Đồ) developed during the time of Emperor Lê Thánh Tông (1460–1497). This encyclopedia was considered one of the oldest and rarely preserved Vietnamese documents regarding the islands. The volume "Đường từ phủ Phụng Thiên đến Chiêm Thành" (The Route to Champa from Phụng Thiên Province), remarkably described the archipelago with maps. For instance, a statement found in the volume read "In the middle of the sea, there is a long sandbank called Bãi Cát Vàng, which is approximately 400-league long and 20-league wide rising up above the sea." Bãi Cát Vàng means Hoàng Sa, Golden Sandbank. In the 18th century, under instructions of the Nguyễn Lords, the salvage operations officially started with the formation of Hoàng Sa and Bắc Hải Companies. Their responsibility was to carry out the mission at Hoàng Sa (Golden Sandbank) and Vạn Lý Trường Sa (Ten-thousand-league Long Sandbank) respectively. This effort was continued thereafter with successive establishments of other naval task units in accordance with strategic policies toward the two archipelagos under the Nguyễn dynasty. Noticeably, a number of naval battles between the Dutch fleet and the Nguyễn Royal Navy occurred in 1643 and 1644. The Hoàng Sa naval task unit consisted of 70 men recruited from An Vĩnh and An Hải villages of Quảng Ngãi, while the majority of members of the Bắc Hải Company came from Bình Thuậnprovince. In 1776, the Phủ Biên Tạp Lục (撫邊雜錄), the Miscellaneous Records on the Pacification of the Frontiers, published by Lê Quý Đôn, a philosopher, an encyclopaedist, and a Minister of Construction of the Lê dynasty (1527–1786). These six volumes detail the Nguyễn dynasty's territories, including the exploitation of the Paracel and Spratly Islands from 1702 onwards. 1777–1784, when traveling to Cochin China, Father Jean-Baptiste Grosier recorded his impression about maritime activities of the Vietnamese from Huế, Đà Nẵng, and Quảng Ngãi. The abbot Grosier wrote that the people from those ports were excellent and cleverest navigators in this Kingdom. One of their activities was making long distance sailing every year to the long chain of islands and rocks known as the Paracels to collect debris from shipwrecks. The Royal Ordinance issued by Emperor Minh Mạng, 1835. 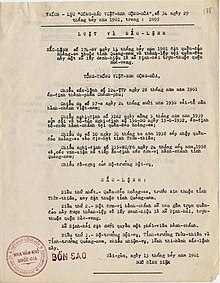 Decree no.174-NV from the presidency of Ngô Đình Diệm, Republic of Vietnam, redistricting the Paracels as part of Quảng Nam Province effective 07-13-1961. Paracels were previously part of Thừa Thiên–Huế Province since 03-30-1938, when redistricted by the government of French Indochina. 1802–1820, under the reign of Emperor Gia Long, the territory of his kingdom included Tonkin,Cochin China, part of Cambodia, and "certain islands off the coast including the well known Paracels which bear such an evil reputation as a source of danger to navigation in the China Seas." In 1807, the East India Company sent Captain Daniel Ross to Cochin China to survey the Paracel Islands. Upon arriving to the kingdom, he presented a letter of introduction entrusted by the English company to the reigning king, who was believed to be Emperor Gia Long at that time. Subsequently, Captain Ross completed chartering the south coast of China in 1807, the Paracel Islands in 1808, part of the coast of Cochin China in 1809, and the coast of Palawan in 1810. Most notably, in his surveys published in 1821 under the title "(South) China Sea, Sheet I & II", the Spratly Islands was referred to as The Dangerous Ground, and was later renamed as Storm Island on the 1859 edition of the chart. Separately, in another document, the "Correct Chart of the China Sea", published by Herbert in 1758, the Paracel archipelago was described as a long group of islands and reefs extending from 13 to 17 degrees North, which approximately correspond to the geographic latitudes of the present-day Spratly and Paracel Islands, respectively. It is quite clearly that the captain himself, and probably most navigators of his time, did not differentiate the two archipelagos, but instead had delineated the present-day Spratly Islands as part of the Paracels. Captain Daniel Ross was a well known hydrographer of the Navy of Government of English Bengal and founder of the Bombay Geographical Society. In 1815, Emperor Gia Long ordered Phạm Quang Anh's Hoàng Sa naval task unit to sail to the islands to make surveys and report on maritime routes and draw up maps. In 1816, according to Jean-Baptiste Chaigneau, Emperor Gia Long officially claimed the sovereignty of the Paracel Islands, which would include the present-day Spratly archipelago. These two islands were later delineated distinctly under the reign of his successor, Emperor Minh Mạng. Chaigneau was one of the most respected advisors to Emperor Gia Long. He spent more than 30 years inCochinchina and became the first French Consul to this kingdom in 1821. In 1821, the Lịch triều hiến chương loại chí (歷朝憲章類誌) published by Phan Huy Chú, a historian, an encyclopaedist, and an officer of the Ministry of Construction in the time of emperor Minh Mạng. This remarkable work was prepared in 10 years (1809–1819) and consisted of 10 volumes. One of them, the Địa Dư Chí volume, details territories of Dai Nam Kingdom. In 1838, he published the Đại Nam Thống Nhất Toàn Đồ, the Unified Đại Nam Complete Map, that distinctly delineated Vạn Lý Trường Sa (the Ten-thousand-league Long Sandbank) and Hoàng Sa (the Golden Sandbank). In 1827, a world atlas produced by Belgian geographer Philippe Vandermaelen was published in Belgium. Vietnam was described by four maps in this atlas. One of these maps has the title "Partie de la Cochinchine", in which Paracel Islands was included, indicating that it was part of Cochinchine (southern Vietnam region). The map also featured geography, politics, minerals and statistics about the Empire of An Nam (former name of Vietnam). Moreover, the map titled "Partie de la Chine" in the atlas had identified Hainan Island as the southernmost point of China at that time. In 1833, Emperor Minh Mạng ordered Ministry of Construction to build a temple, erect steles, and plant many trees on the islands for navigation purposes. In 1834, Emperor Minh Mạng ordered Trương Phúc Sĩ, a naval task unit commander, accompanied by 21 men sailing to the islands to survey and draw map of Hoàng Sa. In 1835, Emperor Minh Mạng issued a royal ordinance to order 24 troops to the Paracel Islands. The royal ordinance has been preserved by generations of Đặng family and was publicly disclosed in early 2009. In 1836, Emperor Minh Mạng received a report from his Ministry of Construction that recommended a comprehensive survey of all the East Sea islands because of their "great strategic importance to our maritime borders." The King ordered Phạm Hữu Nhật, a royal navy commander, to erect a wooden stele on the islands. The post was engraved with the following inscription: The 17th of the reign of Minh Mạng by the royal ordinance commander of the navy Phạm Hữu Nhật came here to Hoàng Sa for reconnaissance to make topographical measurements and leave this stele as record thereof. In 1838, Bishop Jean-Louis Taberd published the "Latin-Annamese Dictionary". The dictionary contains the "An Nam Đại Quốc Họa Đồ" (The Great Annam Map). In the neighborhood of the present-day coordinate of the islands, words found on the map read "Paracel seu Cát Vàng" (Paracel or Cát Vàng). Cát Vàng means Hoàng Sa, Golden Sands or Golden Sandbank. In 1842, Hai Lu Do Chi, a historical Chinese document was written in the 22nd year of the reign of the Daoguang Emperor (1820–1850) of the Qing eynasty (1644 to 1912) of China. A statement found in this book read: Wang Li Shi Tang (万里石塘) is a sandbank rising above the sea. Several thousand leagues in length, it forms a rampart on the periphery of the Kingdom of Annam. Wang Li Shi Tang means Ten-thousand-league Long Sandbank. In 1858, Napoleon III ordered French troops to attack Tourane, the present-day Đà Nẳng city. Subsequently, France launched more attacks and forced Cochin China and some provinces in the South to become her colonies. The French Indochina was formed in 1887 and consisted of Tonkin, Annam, Cochin China, and Cambodia. The 1887 Chinese-Vietnamese Boundary convention signed between France and China after the Sino-French War stated that China was the owner of the Spratly and Paracel islands. 1895–1896, German vessel Bellona and Japanese ship Imezi Maru sank at the islands. Chinese fishermen looted and resold them atHainan. These countries protested but local Chinese authorities, the Governor of Liang Guang, denied any responsibilities on the ground that the Paracels were abandoned and belonged to neither country. In the 1910-20s, the French Ministry of Colonies and the Ministry of Foreign Affairs agreed that the Paracel Islands were under Chinese sovereignty, and that France should not try to claim them, either on behalf of itself, or Annam. Therefore, France did not protest in 1921 when the government of Guangdong province declared the Paracels to be under the administration of Hainan Island. 5 years later in 1926, France refused an application from a French company to exploit guano in the Paracels. It also refused a similar application from a Japanese company. In 1932, France nonetheless formally claimed both the Paracel and Spratly Islands. China and Japan both protested. In 1933, France seized the Paracels and Spratlys, announced their annexation, formally included them in French Indochina, and built a couple of weather stations on them, but did not disturb the numerous Chinese fishermen it found there. In 1938 Japan took the islands from France, garrisoned them, and built a submarine base at Itu Aba (now Taiping / 太平) Island. In 1941, the Japanese Empire made the Paracel and Spratly islands part of Taiwan, then under its rule. After World War II, Nationalist China reaffirmed its sovereignty over the islands in the South China Sea, and dispatched a patrol force to the islands, but this was challenged by the French. After the fall of the nationalist regime in China in 1949, the PRC gained control of the eastern half of the Paracel islands. Several small clashes occurred between the French and the communist Chinese naval forces during this period, but eventually a de facto line of control was established with the PRC occupying Woody Island, while the remainder was held by Franco-Vietnamese forces. In 1951, at the international Treaty of San Francisco conference, Vietnam's representative claimed that both the Paracels and Spratlys are territories of Vietnam, and was met with no challenge from all nations at the event. However, neither the PRC nor the ROC participated in the conference. Separately, the ROC negotiated and signed its own treaty with Japan regarding the islands on April 29, 1952. In 1954, according to the Geneva Agreements, which were signed by a number of nations including the PRC, Vietnam was partitioned into two states, North Vietnamand South Vietnam. The 17th parallel was used as the provisional military demarcation line, which was effectively extended into the territorial waters. The Paracel archipelago lies below this line and belongs to South Vietnam accordingly. In 1956, after the French withdrawal from Vietnam, South Vietnam replaced French control of the islands. By February 1956, the South Vietnamese Navy was already stationed on Pattle Island by Ngô Đình Diệm. Again, both the PRC and ROC politically and diplomatically condemned the decision and reaffirmed their claims to the islands. Although the South Vietnamese "inherited" the French claim to the entire Paracel Islands, the period was peaceful, and both sides held onto what was in their control without venturing into other's domain. At this time, maps and other official documents of the North Vietnam government asserted that the islands belonged to the PRC,mainly due to the fact that the PRC was the largest supporter of North Vietnam during the Vietnam War. On September 4, 1958, the government of the PRC proclaimed the breadth of its territorial sea to be twelve nautical miles (22 km) which applied to all its territory, including the Paracel and Spratly Islands. Ten days later, the prime minister of North Vietnam, Phạm Văn Đồng, in his letter to Zhou Enlai stated that his government had recognized the declaration of the PRC government. On January 19, 1974, the Battle of the Paracel Islands occurred between the PRC and South Vietnam. After the battle, the PRC took control over the entire Paracel Islands. In 1982, Vietnam established Hoang Sa District in Quang Nam-Da Nang covering these islands. In a statement released on 13 July 1999 by the foreign ministry of Taiwan, under President Lee Teng-hui stated that "legally, historically, geographically, or in reality", all of the South China Sea and the islands were Taiwan's territory and under Taiwanese sovereignty. The ROC's and the PRC's claims "mirror" each other. Taiwan and China are largely strategically aligned on the islands issue, since they both claim exactly the same area, so Taiwan's claims are viewed as an extension of China's claims.Taiwan and China both claim the entire island chains, while all the other claimaints only claim portions of them, and China has proposed cooperation with Taiwan against all the other countries claiming the islands, such as Vietnam. China has urged Taiwan to cooperate and offered Taiwan a share in oil and gas resources while shutting out all the other rival claimants. Board director Chiu Yi of Taiwan's state run oil company, CPC Corp, has named Vietnam as the "greatest threat" to Taiwan. America has regularly ignored Taiwan's claims in the South China Sea and does not include Taiwan in any talks on dispute resolution for the area. In July 2012 the National Assembly of Vietnam passed a law demarcating Vietnamese sea borders to include the Paracel and Spratly Islands. In response to the Vietnamese move, Beijing announced the establishment of the prefecture-level city of Sansha covering the Paracel and Spratly Islands. The Philippines and Vietnam promptly lodged diplomatic protests strongly opposing the establishment of the Sansha City under Chinese jurisdiction. In April 2013, a representative from the Vietnamese Foreign Ministry’s National Boundary Commission gave a diplomatic note to a representative of the Chinese Embassy inHanoi demanding that China cancel its plan to bring tourists to the Paracel archipelago. According to reports, at the beginning of May 2014, Chinese and Vietnamese naval vessels collided near the islands as Hanoi sought to prevent a Chinese oil rig from setting up in the area. On May 26, a Vietnamese fishing boat sank near the oil rig, after colliding with a Chinese vessel. As both sides imputed the blame to each other, Vietnam released a video footage in a week later, showing a Chinese vessel ramming into its ship before it sank; the Chinese said they were on the defensive while Vietnamese vessels were attacking the Chinese fishing boats. [when? ]Taiwan rejected all rival claims to the Paracel islands amidst the standoff, repeating its position that all of the Paracel Islands, Spratly Islands, Macclesfield Bank andPratas Islands belong to the Republic of China along with "their surrounding waters and respective seabed and subsoil", and that Taiwan views both Vietnam and mainland China's claims as illegitimate. This statement was released by Taiwan's Ministry of Foreign Affairs, which added – "There is no doubt that the Republic of China has sovereignty over the archipelagos and waters." In January 2016, photographs emerged that indicate that China is reclaiming land and expanding military facilities in the Paracels, including at Duncan Island, North Island, and Tree Island. Commentators have likened this work to the initial stages of China's large-scale construction in the Spratly Islands. The FIPS 10-4 country code for the Paracel Islands is PF. Jones, Gareth Wyn (2002). "Provinces". In Boland-Crewe, Tara and Lea, David. The Territories of the People's Republic of China. London: Europa Publications. p. 101.ISBN 978-0-203-40311-2. 民政部关于国务院批准设立地级三沙市的公告 [Ministry of Public Affairs Announcement: State Council Ratification on the Establishment of Shashi City] (in Chinese). 中华人民共和国民政部 (Ministry of Foreign Affairs of the People's Republic of China). 21 June 2012. Retrieved 24 July 2014. J. B. Nicolas-Denis d'Apres de Mannevillett, Instruction sur la navigation des Indes-Orientales et de la Chine, pour servir au Neptune oriental, Chez Demonville, Paris, 1775. Retrieved 6 April 2009. Young Men's Catholic Association, Catholic progress, Vol. 7, Burns and Oates, London, 1878. Retrieved 6 April 2009. Michael Sullivan, The meeting of Eastern and Western art, Revised and expanded edition. Retrieved 6 April 2009. In June 2014, UK newspaper The Independent stated that Woody Island has a population of 1,443: AP (15 June 2014). "China begins building school on Yongxing island - that has disputed ownership with Vietnam". The Independent (UK). 三沙市全国陆地面积最小人口最少 粮食全靠运输 [Sansha: Smallest Population Density in China - Completely Reliant on Imported Foodstuffs] (in Chinese). Sohu. 9 July 2012. Retrieved 24 July 2014. This is the maximum height, or for submerged features, the minimum depth, in metres. A height of zero indicates low sandy cays or beaches, reefs that dry at low tide, or similar.Source: "The Paracel Islands" (PDF). Sector 1: The South China Sea - Central Part, Sailing Directions - Publication 161 - 14th Edition. National Geospatial-Intelligence Agency, U.S. Government. 12 July 2014. pp. 5–7. Jianming Shen (1998). Myron H. Nordquist, John Norton Moore, eds. Security Flashpoints: Oil, Islands, Sea Access and Military Confrontation. Brill. pp. 158–159.ISBN 978-9041110565. Jianming Shen (1998). Myron H. Nordquist, John Norton Moore, eds. Security Flashpoints: Oil, Islands, Sea Access and Military Confrontation. Brill. pp. 156–157.ISBN 978-9041110565.
a b Jianming Shen (1998). Myron H. Nordquist, John Norton Moore, eds. Security Flashpoints: Oil, Islands, Sea Access and Military Confrontation. Brill. pp. 163–164.ISBN 978-9041110565. Frank H. Columbus, ed. (1 December 1998). Asian Economic and Political Issues, Volume 1. Nova Biomedical. pp. 3–4. ISBN 978-1560725985. "郑和航海图" (Chinese), cited in The Overall Survey of the Ocean's Shores, App. 1: "China in Southern Island". White Lotus Press. ISBN 974-8496-78-3.
a b Jianming Shen (1998). Myron H. Nordquist, John Norton Moore, eds. Security Flashpoints: Oil, Islands, Sea Access and Military Confrontation. Brill. pp. 168–169.ISBN 978-9041110565. Jianming Shen (1998). Myron H. Nordquist, John Norton Moore, eds. Security Flashpoints: Oil, Islands, Sea Access and Military Confrontation. Brill. pp. 170–171.ISBN 978-9041110565. Stefan Talmon, Bing Bing Jia, eds. (1 November 2014). The South China Sea Arbitration: A Chinese Perspective. Hart Publishing. p. 3. ISBN 9781782253754. Martin Riegl, Jakub Landovský, Irina Valko, eds. (26 November 2014). Strategic Regions in 21st Century Power Politics. Cambridge Scholars Publishing. pp. 66–68.ISBN 9781443871341.
a b c d e f Tập San Sử Địa. "Đặc Khảo Hoàng Sa và Trường Sa – A Special Research on Paracel and Spratly Islands" (PDF). Geographical Digest, Vol 29., Saigon, 1974. Reproduced version. Retrieved 2009-04-13. Saxe Bannister, A Journal of the First French Embassy to China, 1698–1700, Thomas Cautley Newby Publisher, 1859. Retrieved 2009-04-25. Conrad Malte-Brun, Universal geography, Vol. 2, John Laval and S.F. Bradford, Philadelphia, 1829. Retrieved 2009-04-25. 36. Li Jinming 1997, p. 71. 38. 驳斥谎言! 越南的黄沙,长沙不是中国的西沙南沙 [Vietnam refutes claim that Huangsha and Changsha are China's Xisha and Nansha Islands] (in Chinese). military.china.com. 28 July 2012. Retrieved 24 July 2014. 41. ^ a b Nguyễn Đại Việt, Paracel and Spratly Islands on Charts and Maps made by Westerners, Hoàng Sa và Trường Sa trên Bản đồ Tây Phương, 2009. 42. Henry Yule, Arthur Coke Burnell, Hobson-Jobson: The Anglo-Indian Dictionary, Published by Wordsworth Editions, 1886. Retrieved on 7-7-2014. 44. Bristow, Michael (16 June 2014). "China to build school on disputed Paracel Islands".BBC News. Retrieved 3 October 2014. 45. "Construction tensions in the South China Sea". Asia Times. 26 October 2012. 49. ^ a b Ethirajan, Anbarasan (1 October 2014). "Tourists "used" in China-Vietnam Paracel Islands dispute". BBC News Newsday. Retrieved 3 October 2014. The page contains an interesting video. On completion of the video, the page links toanother article, dated 16 June 2014, also containing an interesting video. And so on. 50. "China approves dock project in disputed Paracel islands". BBC News (China). 27 April 2012. 51. "Paracel Islands (Paracel Islands - the new Great Barrier Reef)". VisitHainan.com.au. Retrieved 23 Nov 2014. 52. "China official denies plans for Paracel Islands tourism". The China Post. 6 April 2012. 53. Daniel J. Dzurek (1996). The Spratly Islands Dispute: Who's on First?. IBRU. p. 9.ISBN 978-1-897643-23-5. 56. Thomas J. Cutler, The Battle for the Paracel Islands, Naval Institute Press, Annapolis, MD. Retrieved on 4-24-2009. 59. 我国对西沙南沙群岛主权的历史和法理依据 [Chinese Sovereignty Over the Xisha and Nansha Islands - Historic and Legal Basis for the Claim] (in Chinese). CNKI. Retrieved24 July 2014. 60. ed. Kivimäki 2002, p. 9. 61. Bateman, Emmers 2008, p. 43. 62. ^ a b Wortzel, Larry M.; Higham, Robin D. S. (1999). Dictionary of Contemporary Chinese Military History (illustrated ed.). ABC-CLIO. p. 180. ISBN 0313293376. 63. Rodolfo Severino (2011). Where in the World is the Philippines? : Debating Its National Territory. Institute of Southeast Asian Studies. pp. 76–. ISBN 978-981-4311-71-7. 64. ^ a b Severino 2011, p. 76. 65. Myron H. Nordquist, John Norton Moore, University of Virginia, "Security flashpoints: oil, islands, sea access and military confrontation", pp. 165–174. 66. Timo Kivimäki (2002). War Or Peace in the South China Sea?. NIAS Press. p. 10.ISBN 978-87-91114-01-4. 67. ^ a b Morley, James W.; Nishihara, Masashi (7 January 1997). Vietnam Joins the World. M.E. Sharpe. pp. 126–127. ISBN 978-0-7656-3306-4. 68. ^ a b Severino 2011, p. 74. 70. ed. Kivimäki 2002, p. 11. 71. The Editors of Encyclopædia Britannica. 72. W.J.M. Buch, La Compagnie des Indes Néerlandaises et l'Indochine, pp.134–135, 1936, Persee. Retrieved May 4, 2009. 73. Đỗ Bá Công Đạo, Toàn Tập Thiên Nam Tứ Chí Lộ Đồ Thư, Translated into modern Vietnamese from Chinese by Buu Cam, Hồng Đức Bản Đồ, Saigon, 1962. 74. ^ a b Lê Quý Đôn, The Encyclopedia of Thuận Hóa and Quảng Nam Phủ Biên Tập Lục, 1776. Translated into modern Vietnamese from Chinese by Le Xuan Giao, Saigon, 1972. 79. ^ a b David Hancox et al., A Geographical Description of the Spratly Islands and an Account of Hydrographic Surveys Amongst Those Islands, Marine Time Briefing, Vol. 1–6, pp. 31–32, International Research Unit. Retrieved November 4, 2009. 81. ^ a b c d The Encyclopedia of Nguyễn Dynasty History "Đại Nam Thực Lục Chính Biên", 1848 (Part I), 1864 (Part II), 1879 (Part III). 82. J. B. Chaigneau, Le Mémoire sur la Cochinchine, 1820. 83. Thanh Nien News (14 May 2014). "Vietnam submits atlas as proof of island ownership". Thanh Niên. Retrieved 7 June 2014. 84. Tìm thấy sắc chỉ cổ về Hoàng Sa, BBC, Retrieved February 4, 2009. 86. ^ a b c d e Stein Tonnesson, International Peace Research Institute, Oslo, The South China Sea in the Age of European Decline, pp. 2–4, 12, 40–41, Modern Asian Studies, Cambridge University Press, United Kingdom, 2006. Retrieved 2009-4-13. 87. 1954: Peace deal ends Indo-China war, BBC News. Retrieved on 4-23-2009. 88. Robert B. Asprey, War in the Shadows, IUniverse, 2002. ISBN 0-595-22594-2. Retrieved on 4-23-2009. 89. Myron H. Nordquist et al., University of Virginia, Center for Oceans Law, Security Flashpoints, pp.142–143, Martinus Nijhoff Publishers, 1998. Retrieved on 4-17-2009. 91. "Late Vietnam PM’s letter gives no legal basis to China’s island claim". Thanh Niên. Retrieved Jun 10, 2014. 92. (Vietnamese)"Huyện đảo Hoàng Sa". Da Nang City. Retrieved August 28, 2012. 93. "The Hoang Sa (Paracel) and Truong Sa (Spratly) archipelagoes and international law 1988". Authority of Foreign Information Service of Vietnam. Archived from the originalon March 13, 2013. Retrieved August 28, 2012. 94. http://www.atimes.com/china/AG15Ad01.html STRATFOR's 1999 Archived May 17, 2014, at the Wayback Machine. 95. http://www.atimes.com/atimes/China/LG29Ad01.html Sisci 2010 Archived July 22, 2013, at the Wayback Machine. 96. Wortzel, Higham 1999, p. 180. 97. ^ a b http://www.atimes.com/atimes/China/NH10Ad01.html Kastner Aug 10, 2012.Archived December 7, 2013, at the Wayback Machine. 98. http://www.atimes.com/atimes/China/NF13Ad01.html Kastner Jun 13, 2012.Archived August 16, 2015, at the Wayback Machine. 99. http://www.atimes.com/atimes/China/CHINA-01-140213.html Womack Feb 14, 2013.Archived January 13, 2015, at the Wayback Machine. 103. "Philippines summons Chinese ambassador to protest Sansha city". Sina.com. July 6, 2012. Retrieved July 24, 2012. 105. Associated Press (7 May 2014). "Ships collide as Vietnam tries to stop China oil rig deployment in disputed waters". South China Morning Post. Retrieved 7 May 2014. 106. Bloomberg News (6 June 2014). "Vietnam Says China Still Ramming Boats, Airs Sinking Video". Bloomberg. Retrieved 6 June 2014. 107. Staff writer with CNA (11 May 2014). "Taiwan reiterates Paracel Islands sovereignty claim". "Taipei Times". p. 3. 108. Victor Robert Lee (13 February 2016). "Satellite Images: China Manufactures Land at New Sites in the Paracel Islands". The Diplomat. Retrieved 2016-02-17. 109. 《南海风云》 [Storm in the South China Sea] (in Chinese). Retrieved 24 July 2014. 110. 《南海风云》 [Storm in the South China Sea] (in Chinese). Douban. Retrieved July 24,2014. (1686) Do Ba Cong Dao (translated by Buu Cam), "Toan Tap Thien Nam Tu Chí Lo Do Thu ", Hong Duc Ban Do, Saigon, 1962. (1776) Le Quí Don (translated by Le Xuan Giao), "Phu Bien Tap Luc", Saigon, 1972. (1837) Jean Louis TABERD, "Note on the Geography of Cochinchina", Journal of the Royal Asiatic Society of Bengal, Calcutta, Vol. VI, 9/1837. (1999) Vietnamese Claims to the Truong Sa Archipelago. Todd C. Kelly, August 1999. Bateman, Sam; Emmers, Ralf, eds. (2008). Security and International Politics in the South China Sea: Towards a co-operative management regime (illustrated ed.). Taylor & Francis. ISBN 0203885244. Bezlova, Antoaneta (Jan 29, 2008). "China moves to expand its reach". Asia Times. Retrieved 10 March 2014. Bouchat, Clarence J. (2014). The Paracel Islands and U.S. Interests and Approaches in the South China Sea. Carlisle, PA: Strategic Studies Institute and U.S. Army War College Press. ISBN 9781584876236. Retrieved 25 July 2014. The Editors of Encyclopædia Britannica. "Spratly Islands - Britannica Online Encyclopedia". Darshana Das, Gloria Lotha. Britannica.com. Retrieved 16 April 2014. Kastner, Jens (Aug 10, 2012). "Taiwan pours cement on maritime dispute". Asia Times. Retrieved 10 March 2014. Lee, Peter (Jul 29, 2010). "US goes fishing for trouble". Asia Times. p. 2. Retrieved 14 May 2014. Lin, Cheng-yi (Feb 22, 2008). "Buffer benefits in Spratly initiative". Asia Times. pp. 1–2. Retrieved 14 May 2014. Morley, James W.; Nishihara, Masashi, eds. (1997). Vietnam Joins the World. M.E. Sharpe. ISBN 076563306X. Pak, Hŭi-gwŏn (2000). The Law of the Sea and Northeast Asia: A Challenge for Cooperation. Volume 35 of Publications on Ocean Development, V. 35 (illustrated ed.). Martinus Nijhoff Publishers. ISBN 9041114076. Severino, Rodolfo (2011). Where in the World is the Philippines? : Debating Its National Territory (illustrated ed.). Institute of Southeast Asian Studies. ISBN 9814311715. Sisci, Francesco (Jun 29, 2010). "US toe-dipping muddies South China Sea". Asia Times. Retrieved 14 May 2014. STRATFOR's Global Intelligence Update (July 14, 1999). "Taiwan sticks to its guns, to U.S. chagrin". Asia Times. Retrieved 10 March 2014. Womack, Brantly (Feb 14, 2013). "Rethinking the US-China-Taiwan triangle". Asia Times. Retrieved 14 May 2014. Wortzel, Larry M.; Higham, Robin D. S. (1999). Dictionary of Contemporary Chinese Military History. ABC-CLIO. ISBN 0313293376. Editorial (2014-05-13). "Timing of flareups in South China Sea is no coincidence". Want China Times. Retrieved 14 May 2014.